Commission won’t investigate improper documentation of funds in 2002 council run by Your Black Muslim Bakery member Nedir Bey. Elections officials are proving yet again that Nedir Bey, a confidant of the late Your Black Muslim Bakery founder Yusuf Bey, can do no wrong. Sacramento for five years sat on a request to investigate alleged campaign finance irregularities committed by Nedir Bey, who owes the city of Oakland $1.5 million in another matter, then dropped the probe because too much time had elapsed. Nedir Bey ran for the Oakland City Council’s District 4 seat in March 2002 but won only 268 votes. He received $14,178 in public matching funds for his campaign despite questions raised by the head of Oakland’s Public Ethics Commission about the source of the campaign contributions he received. Roman Porter, communications director for the FPPC, said he could not say why the investigation lagged as long as it did, other than to say that a former enforcement official refrained from pursuing the case. Porter said the previous enforcement chief also closed a large number of cases to decrease a backlog, but Bey’s wasn’t one of them. A new chairman and enforcement team came on board last year, but by that time the statute of limitations had already applied on two of the matters contained in Oakland’s complaint, and there wasn’t enough time left to investigate the third matter, Porter said. But there is still the question of why Dan Purnell, executive director of Oakland’s Public Ethics Commission, booted the complaint to Sacramento instead of referring it to local authorities. According to the city’s municipal code governing elections, the Public Ethics Commission has the sole authority for civil enforcement of the Limited Public Financing Act, which contains regulations for disbursing matching funds. Purnell suspected irregularities in Nedir Bey’s campaign expenditures as early as January 2002, 10 months before he asked the state FPPC to initiate an investigation. The March 2002 election was the first to offer public financing to candidates who agreed to abide by voluntary spending limits. Candidates in the District 4 election could qualify for up to $14,700 in matching public funds from a special account established by the city of Oakland to help defray the cost of running for office. Matched contributions has to be $100 or less. The Committee to Elect Nedir Bey reported it had raised a total of $14,517, of which $14,178 was eligible for matching funds. The campaign reported it spent a total of $39,741 on the election. Documents obtained from the FPPC by the Chauncey Bailey Project through a public records request show that out of 145 contributions, 123 were made with $99 money orders with sequential numbers, all purchased from the same location over a four-day period between Jan. 14 and Jan. 18, 2002. Only 22 donations from Bey’s campaign were written on personal checks. minors, although it turned out that is not true, according to birth records. Nearly all of them listed their address as 5832 or 5836 San Pablo Ave., addresses used at that time for Your Black Muslim Bakery. Once Bey got the money, he stopped filing required campaign finance statements with the city. When he did eventually file them in September 2002, the forms offered no detailed accounting of $39,741 in expenditures. Nor did Bey explain the gap between the amount spent on his campaign and contributions received, which totaled $28,695 including the public matching funds. Often the bulk of election costs come from consultants’ fees, printed campaign material, fundraising events and office rental. Bey’s committee paid all but $500 to a person by the name of Vaughan Foster, who provided no address or further identification. Foster received $27,000 for salary, $11,000 for circulating petitions, $241 for voter registration and $1,000 for phone banking. But not until August 2007, nearly five years after Purnell’s letter and four years after he forwarded hundreds of pages of documentation from the campaign to Dan Schek, an FPPC investigator, did Bey receive a letter declaring the case closed. The FPPC also moved to subpoena bank records and other material during the intervening years. Jean Quan, the District 4 incumbent who ran against Bey in 2002, said she didn’t recall him stumping widely or knocking on doors in the area’s neighborhoods. She was surprised he raised $15,000 from private donors to begin with and said he didn’t appear to spend much of it on campaign signs. “I ran into a few fliers of his, but nothing that would cost $30,000,” Quan said. According to the city’s municipal code governing elections, the Public Ethics Commission is supposed to “promptly advise” the city attorney in writing, as well as the “appropriate prosecuting enforcement agency,” of any evidence of criminal violations. The law also gives the local commission broad latitude to recover the funds, including penalties and fines not to exceed $1,000 per violation. It also gives the commission authority to sue the candidate. But none of that was done in Bey’s case, Purnell said. The matter was referred to the state because the Public Ethics Commission does not have the authority to enforce state elections laws, which at that time appeared to be Bey’s most obvious violation, Purnell said. “To make a criminal complaint, we have to prove intent,” Purnell said. He said he was never pressured by anyone to refer the matter to the state instead of local authorities. 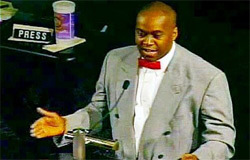 Back then he had no idea who Nedir Bey was or that he was connected to Your Black Muslim Bakery, or that he had defaulted on a $1.1 million economic revitalization loan from the city of Oakland just a few years before running for the Oakland City Council, Purnell said. “I didn’t know Nedir Bey from Adam,” Purnell said, adding he later learned of Bey’s background from a November 2002 article in the East Bay Express. The city’s original public financing ordinance was less restrictive regarding matching contributions, but Bey’s campaign helped change that. Contributions made by money order are no longer eligible for matching funds and now must be made on two-party checks drawn on the bank account of the contributors. Nedir Bey has not run for public office since the 2002 council race, nor has he been actively involved in bakery operations since his company, E.M. Health Services, failed in 1999 and he defaulted on a $1.1 million city loan. Since then, fees and accrued interest have propelled the loan amount to $1.5 million. Bey represented himself as a spiritual adviser to the late Antar Bey, who was briefly head of Your Black Muslim Bakery. Other bakery associates face numerous criminal allegations in Alameda County including torture, kidnapping, real-estate fraud and the Aug. 2 killing of Oakland journalist Chauncey Bailey, who was working on stories about the Bey empire. Most recently Nedir Bey has served as president of the school site council for Fruitvale Elementary School. Bob Stern, president of the Center for Governmental Studies in Los Angeles, said the understaffed FPPC can’t investigate every small-time municipal election when the total expenditures are small relative to the outsized war chests of state-level candidates and committees supporting ballot propositions. Plus, he said, the FPPC only had jurisdiction over whether Nedir Bey actually itemized his expenses, not necessarily how he spent the money. Oakland officials are responsible for policing matching funds, and Stern wonders why the ethics commission didn’t call Bey’s donors to confirm they’d purchased the money orders themselves. Local elections watchdogs often aren’t in a position to conduct detailed probes themselves, however. The result, Stern said, could be less support from voters for matching funds if it appears that candidates can corrupt the process. Cecily Burt is an Oakland Tribune staff writer. G.W. Schulz is a staff writer at the San Francisco Bay Guardian. Last year, trying to throw more of our money to Foster’s cloak ‘n dagger poison pill project, (besides Natalie Bateson), we found the BART (of Oscar Grant infamy) directors Franklin, Sweet and Allen, when the appropriatelyt named “Solar Eclipse” alternate energy scam was in the news . (And as attorney for BART’s Meserle and Bailey murder boss Longmire, we find the same man, Michael Rains, spinning donuts for bad cops over the graves of both Chauncey Baqiley and Oscar Grant, driving the getaway car.